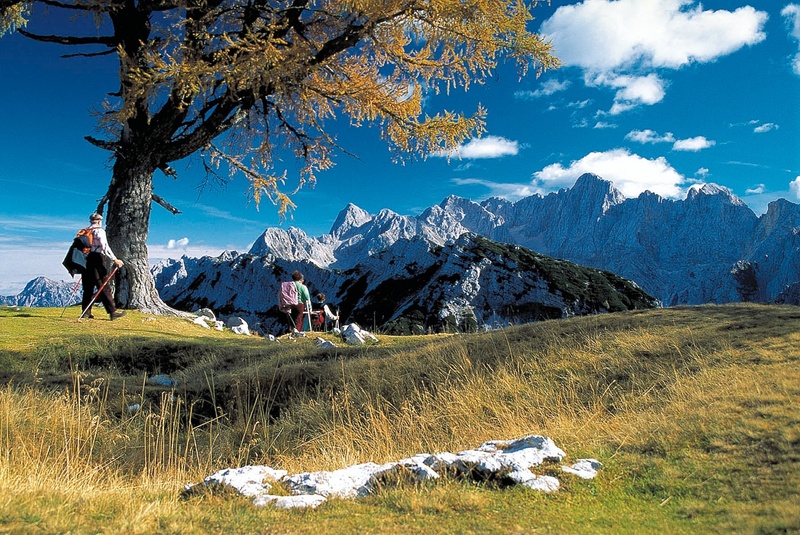 Trekking in Triglav national park is one of the highlights of active tourism in Slovenia. Triglav 2864m / 9,396 ft lies in the heart of Triglav national park, one and only national park in Slovenia. Julian Alps are like kingdom for Slovenians. You can climb Triglav, just like every Slovenian does or do trekking in Triglav national park. Join us hiking in Slovenia. Hiking equipment is essential. Please consult with a mountain walking leader about the equipment, physical state/ experience and the rest in advance. In case of bad weather or any other dangerous conditions the hiking trip can be cancelled or rescheduled. Day 1: Arrival to Slovenia. Accomodation in mountain hut. Dinner. Overnight stay in multibed-rooms in Vrata valley 1015m. Day 2: Breakfast. Hiking tour: Vrata valley 1015m – Luknja pass 1758m – Dolič hut 2145m. Dinner. Overnight stay in multibed-rooms. Day 3: Breakfast. Hiking tour: Dolič hut 2145m – Hribarice pass 2333m – Prehodavci hut 2063m –Triglav valley of 7 lakes – Triglav lakes hut 1648m. Dinner. Overnight stay in multibed-rooms. Day 4: Breakfast. Hiking tour: Triglav lakes hut 1648m – Komna hut 1520m – Black lake – Hut on the pasture by the lake 1502m. Dinner. Overnight stay in multibed-rooms. Day 5: Breakfast. Hiking tour: Hut on the pasture by the lake 1502m – Vogar hut 1054m – Stara Fužina – Bohinj lake 527m – Savica hut 653m. Dinner. Overnight stay in multibed-rooms. Day 6: Breakfast at Savica hut 653m. Short hiking to Savica waterfall. Visit of Bled or Ljubljana. Departure. Price for trekking in Triglav national park: 299€* per person (min 15 pax) or 329€* per person (min 10 pax) or 449€* per person (min 5 pax) – Also bigger groups are invited. *If you are not member of UIAA you have to pay 100€/ person extra. Entrance fees, personal expenses and activities out of the programme. SPECIAL OFFER FOR GROUPS: We adapt the programme exclusively for you.